Ant and I met in 2011 at a hotel and started dating a month later. By then, both of us were studying academic English in Boston - the city that we live in today. A few months after we started dating, I had to go back to Brazil to graduate from business school. He was studying in Boston, so we maintained a distant relationship for a while. It wasn't easy, but we like to think that everything we'd been through took us where we are today. On my graduation day, Ant landed in my home town - Porto Alegre. He wanted to meet my family, my friends and my country. Everything was so new to him, and it was such a lovely surprise to have him there - I'm still proud of how brave he was to book a flight to another hemisphere and go all by himself! It was worth it; we had a beautiful time. A few months after his visit, it was my time to go back to Boston as I promised him. Time passed by so quickly. We rented our first apartment together, got our first corporate jobs, bought our first car. Once we were settled and stable, he proposed. And the rest is history! When we started planning the wedding, I had a very clear vision of what I wanted in terms of style (I'm very lucky that my fiancé agreed with me on that), so we started recruiting our team of vendors right away. The first vendor we went after? The photographer. I worked with Renee Hollingshead in the past, when she photographed our work at the Intrigued Experience conference in Annapolis, Maryland. The photos came out beautifully - her natural style and film photography technique captured the essence of our secret garden themed watercolor invitation set, and I loved everything about the outcome. Although I knew she was based in Maryland, I sent her an inquiry. 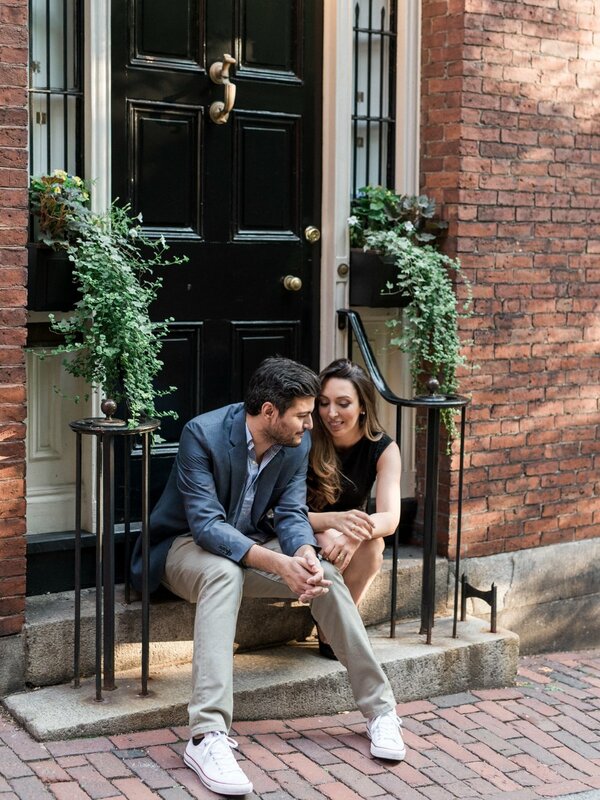 She was willing to come to Boston for our engagement session and wedding - lucky us! - and we booked her services right away. She is the artist behind these photos. 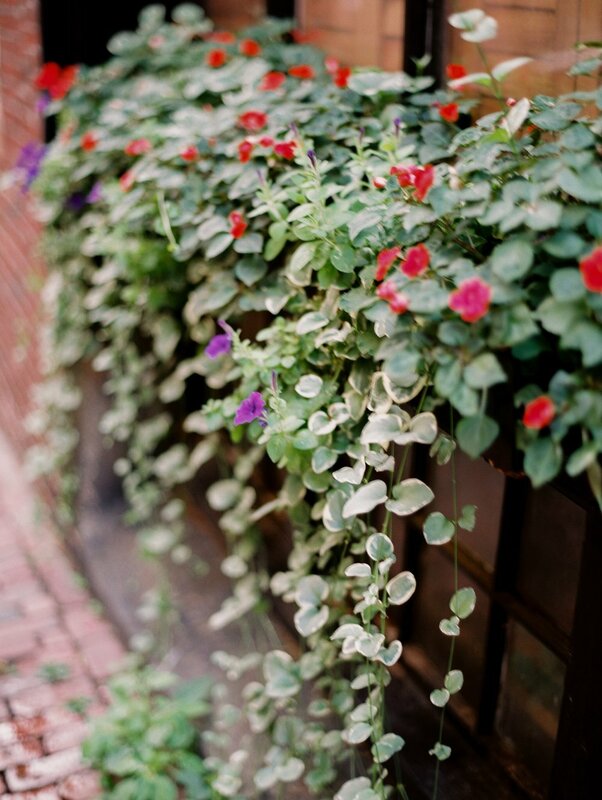 We photographed at three different sites in Boston: Acorn Street and Tatte Bakery, both in Beacon Hill, and the Boston Public Garden - our favorite park in town. Because we used to live in Back Bay (we met there!) and walk to those places every day, the location was very meaningful to us. I wanted the photo shoot to show my passion for watercolor illustration and for Vie de Vic, my watercolor illustration brand. Because our wedding will be full of watercolor details, we wanted the engagement session to reflect that as some sort of a big day's teaser. I created a watercolor wedding save the date and mini watercolor portraits of Ant and I for the session, using our wedding's color palette. The square gray save the date envelope was sealed with an antique gold wax seal - I've been so into that lately! Vintage stamps in shades of green were added to the back of the envelope, too. As a final styling touch, Renee brought in the dreamiest vintage ring box to display my engagement bling! We also added a beautiful Sofia chair from our partners at Kadeema Rentals to the photoshoot. It was hard to choose between so many beautiful pieces, but the bergere style - french looking wooden chair structure and linen upholstery - sounded just right. Classic, chic and timeless. Last but not least, the beauty squad! I had Claudia Moriel from Style at Work do my makeup. She did exactly what I wanted: a natural looking airbrush makeup, perfect for a city sesh. The airbrush technique lasts forever, it was late night and I was still rocking this amazing look! My hair was done by Nazila Riahi from Acote Salon - she did a simple but killer blowout and curls. Thank you to everyone who made these beautiful photos come true. We are excited to reunite the same team for the wedding next year!